Companies are realizing dramatic improvements in their operations by switching from conventional paper based to electronic document and records management systems. Take a closer look at what your on-site record storage is costing you. The first thing you'll probably see is a large area of unproductive office space for which you're paying rent. You may also find important records unsecured, hard to access and difficult to find... with one or more highly-paid employees constantly spending valuable time searching for documents. One of our insurance clients was able to handle a contract adding 28,000 members without adding personnel. One of our hospital clients saved over $1.2 Million of federal funds it had lost in previous years due to reporting deficiencies. One of our private banking clients has been able to consistently acquire other banks and branches while improving productivity and customer satisfaction. One of our large retail clients saves over $350,000 per year only in early-payment discounts, and has improved its relationships with vendors by their quick problem resolution. We provide complete solutions for your document and records management needs. A complete solution consists of the proper mix of software products, hardware products and services. 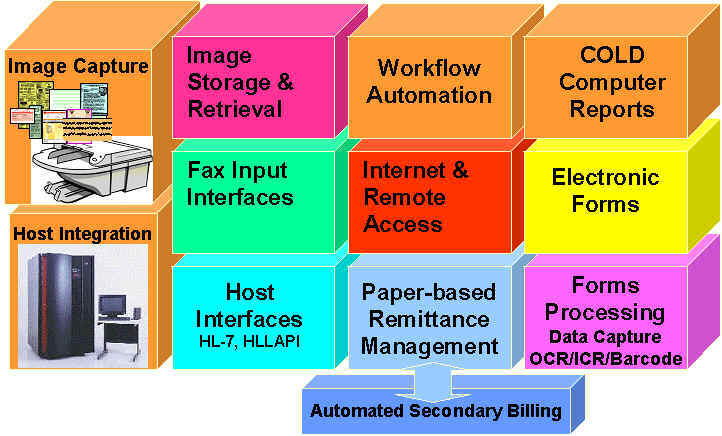 Their full benefits are achieved when integrated properly with existing Line Of Business (LOB) applications. Among the tools we use are "Best-of-Breed" products by the leaders in each respective industry for electronic document and records management. A study by Coopers & Lybrand in 1993 indicated that in the average office, 19 copies are made of each paper document, $20 is spent on labor for filing, $120 is spent on labor searching for misfiled documents, 7.5 percent of the documents were lost forever, and the labor cost a staggering $250 to recreate an original document. Healthcare administrative costs continue to spiral, yet it is estimated that approximately 35% of healthcare costs are attributed to non-critical records management and documentation. Imaging and electronic document management can significantly reduce document storage and handling costs and increase productivity. Extremely flexible solutions easily co-exist within your existing technology infrastructure. Runs under Microsoft Windows 95,98, NT, XP..
Seamless integration with Unix, Minicomputer or Mainframe based servers. Secure access to documents via Intranet and Internet using Standard Web Browsers... no plug-in's required. Industry-standard SQL Databases including; Oracle, Microsoft SQL-Server, Sybase, and Informix.